This could have turned out very, very badly - and might still. Right here in Jerusalem, side by side with ordinary, constructive lives being lived by most of the people who call this special city home, a cluster of death-cultists - yet another in a lengthening string of them, working in dark places and preparing unspeakably dark plans involving injuries, mayhem and deaths - has been stopped. No one imagines they are the only such cluster of plotters or that there will not be others on the way. But these, at least, have been stopped for now. The article makes clear that some of the intelligence that led to the unraveling of this group's plans came from interrogations carried out by PA security officers of Hamas people arrested by them. As we keep noting in this blog, Hamas operates throughout the areas occupied by the PA, in some places more publicly, in others less. Their hand, not to mention their flags and the signs of their terror-focused activities, are everywhere. Ahmad Jamal Mousa Azzam, 24, from Qalqilya, at some point a student at Al-Quds University in Abu Dis: Considered the terrorist ringleader, and controlled from Gaza. He was given training by his handlers in "how to create explosive belts and vests, as well as improvised explosive devices". 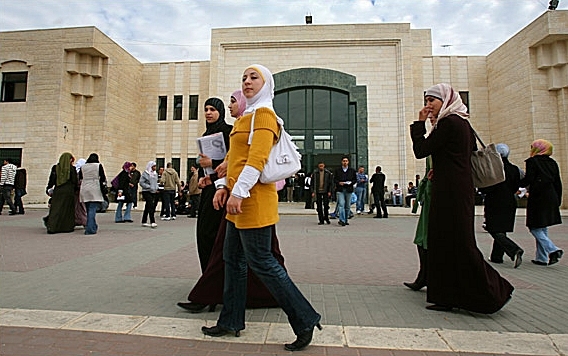 Once in, Azzam recruited the others, mostly from among the Al-Quds student body. Some of those were intended to become human bombs. Hazem Ziad Amran Sandouqa, 22, a resident of the Old City of Jerusalem and an Israeli citizen - therefore able to move around with relative ease, an obvious strategic advantage to the planning and execution of terror. Fahdi Daoud Muhammad Abu Qaian, 19, also an Israeli citizen, a Bedouin from the Negev, and a designated attacker in the terror plot. Under interrogation, he confessed that he was being prepared for a bombing mission by means of an explosive vest or by driving an explosives-packed vehicle into an Israeli target (we're guessing the target would have consisted of human beings). Issa Nasser Issa Shoka, 19, an Al-Quds University student, a designated money courier and intending human bomb, as well as one of the leaders of the Bethlehem cell. Muhammad Waleed Ahmad Sarhkhan, 20, of the Bethlehem cell. Muhammad Na’im Issa Ali, 19, also from the Bethlehem cell, another intending human bomb. Viewing yesterday's IDF real-time video (above) of soldiers breaking into the Jerusalem lab and doing an inventory of the chemicals they found there turns this into something more real and immediate. For purposes of bomb making, the jihadist/murderers had stocked up (something we have not seen reported so far in the news) on nitro-glycerine and cyanide - they're shown clearly. That's in addition to an evil scientist's trove of lethal substances and explosives intended for killing and seriously harming people. Experience tells us those people would have been innocent Israelis, almost certainly civilians. That's how terror works. We blogged last month ["27-Nov-14: Hamas terrorist ring is busted; Israel says the handlers operate from Turkey; Qatar is involved"] about the meaningfully-malevolent role of Shalit Deal releasees. And we offered more background here: "11-Dec-15: The price of the Shalit Deal and the countries that help it keep rising". The price paid by Israeli society - and in a meaningful sense also by the Palestinian Arabs - for this catastrophic transaction keeps growing. Yet there remains, it has to be said and with some pain, a striking unwillingness among the insiders of our government to properly analyze what was done, reach operative conclusions and express sincere regret. It's surely called for.